Campus Life & Engagement’s (formerly First-Year Office) Discover McGill Day 2013, which takes place Tuesday, Aug. 27, will offer the McGill Community three opportunities to help welcome this year’s incoming class and to be involved in the University’s orientation welcome events. 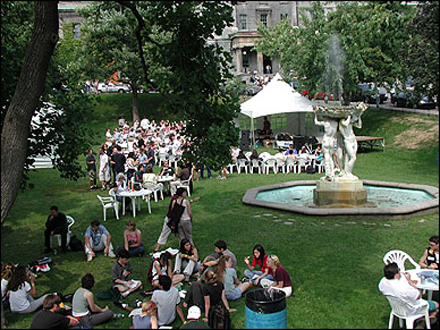 Staff and faculty can join in on welcome lines at the morning session, help McGill Student Housing and Hospitality prepare for their “McGill Feeding McGill” event, and/or attend the brand-new Engage McGill community and fundraising event supporting the people affected by the recent tragedy in Lac Mégantic. For more information, click here.